Why use this method of teaching? The 21st century learning skills* require students to build reading, writing, problem-solving and application competencies. The teacher is supposed to teach less content and more skills. Cooperative learning is the perfect teaching methodology to teach students strategies and skills. It also a great model to show students how to apply those skills to study content. *The 21st century learning skills are often called the 4 C’s: critical thinking, creative thinking, communicating, and collaborating. These skills help students learn, and so they are vital to success in school and beyond. If you teach your students skills, they will become proficient, adaptable and life-long learners. And this works for ALL SUBJECTS. No matter the content, students who are skilled learners can study any subject, at any time and at any place. Cooperative learning also fosters a student’s ability to work in a team and to regularly reflect on his/her learning. The teacher* assigns students in groups with specific roles and jobs. After team members are organized into these small groups, usually of four people, and receive instruction from their teacher, students within the team cooperate with one another and work through the assignment until each team member successfully understands and completes it. Ultimately the shared goals are accomplished individually by each team member, and collectively by the group as a whole. Teacher-selected groups have been proven time and again to be the best method of forming teams because it ensures a good mix and avoids friends from working together, which neglects to achieve the goal of improvement of social interactions among students who do not know each other as well. Team members are responsible for their own individual learning as well as for their teammates learning. Members benefit from the contributions of the individual team members. 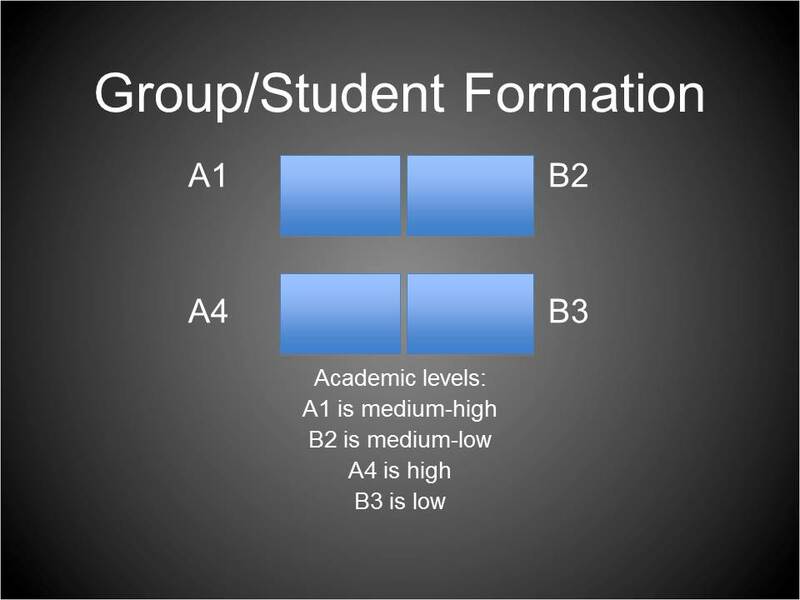 Groups are heterogeneous are made up of high, medium and low academic achieving students. Team members acquire new skills and knowledge. Rewards are oriented towards individual and group. Teachers usually provide verbal information along with worksheets, outlines and study guides during a cooperative learning lesson. Reflection (group processing) is an essential part of the cooperative learning process. By clarifying and describing which actions and decisions were helpful and unhelpful the group continues the learning process and improves each members effectiveness when contributing to a collaborative group. The research of David and Roger Johnson, provides the foundation for how cooperative learning is structured in most of today’s classrooms. Their research shows that merely because students work in small groups does not mean they are cooperating to ensure their own learning and the learning of all others in the group. Dr. Slavin suggests that cooperative learning is doubtlessly a great tool for handicapped and disabled students. Cooperative learning encourages these students and molds them to work in a professional environment. Cooperative learning of disabled and normal students is another great way of encourage disabled students. According to Slavin, when disabled and handicapped students work in mainstream and heterogeneous environments, they learn in a more productive and skillful manner. Kagan Structures are easy-to-learn and easy-to-use instructional strategies, ideal for promoting second language learning. In classrooms in which the Kagan Structures are used regularly, students for whom English is a second language learn both English and academic content far more quickly and far more thoroughly than when traditional instructional strategies are used. The Kagan Structures also promote language and content learning far more than does group work. For example, Kagan instructs teachers to use a “Timed Pair Share” structure. In this exercise, the teacher divides the class into pairs of students and poses a question. Within each pair, Student A talks about his or her answer for one minute, then Student B does the same. • Inside-Outside Circle: In concentric circles, students rotate to face new partners and then answer or discuss teacher questions. • Rally Table: In pairs, students alternate generating written responses or solving problems. • One Stray: On each team, one teammate “strays” from his or her team to a new team to share information. • Rally Robin: In pairs, students alternate generating oral responses. • Rally Coach: Partners take turns, one solving a problem while the other coaches. • Showdown: One teammate reads a question or problem aloud. Students work independently to solve the problem, then show their answers when a teammate calls, “Showdown!” They then celebrate the correct answer or coach to get the correct answer (Kagan 1994). Learning to Think, Thinking to Learn. Thirty years ago, some theories about teaching and learning were based on training exercises and drills. The idea was that if facts were repeated enough, then students would memorize them, and this was learning. Under this concept learning is shown by a change in behavior as a result of experience, but nothing is mentioned about what students believe, what process they use to solve problems, or their own awareness of their thinking. This post is based on the idea that teaching means teaching students to think. It assumes that teaching is not just about communicating facts or mechanical skills like Math rules (of course, you must have facts in order to learn), but is a process of coming to understand how you think. The idea that all students should learn how to think critically is a relatively new one (certainly since the turn of the 20th century) and one for which most schools are not well prepared. The point is how we teach thinking, and how to make students aware of their thinking. 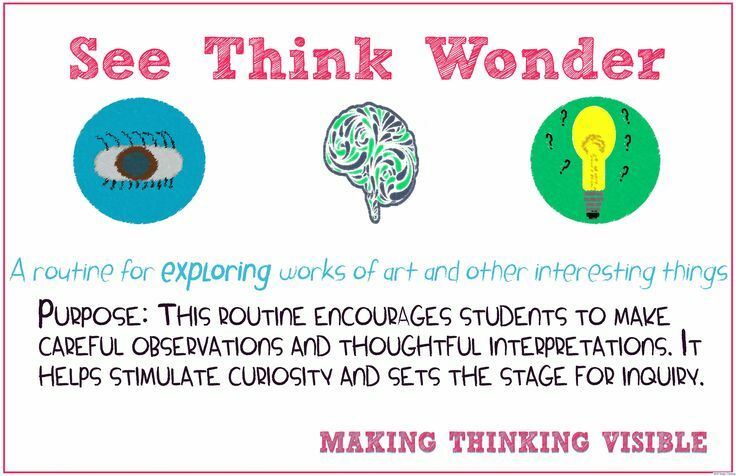 Visible Thinking is a flexible approach to integrating the teaching and development of thinking with your content and curriculum. This is a project of Harvard University. The essence of this project is a series of routines for thinking. They are simple and to the point. The central idea of Visible Thinking is very simple: making thinking visible. We learn best what we can see and hear, although thinking is pretty much invisible. Mostly, thinking happens under the hood, within the marvelous engine of our mind-brain. 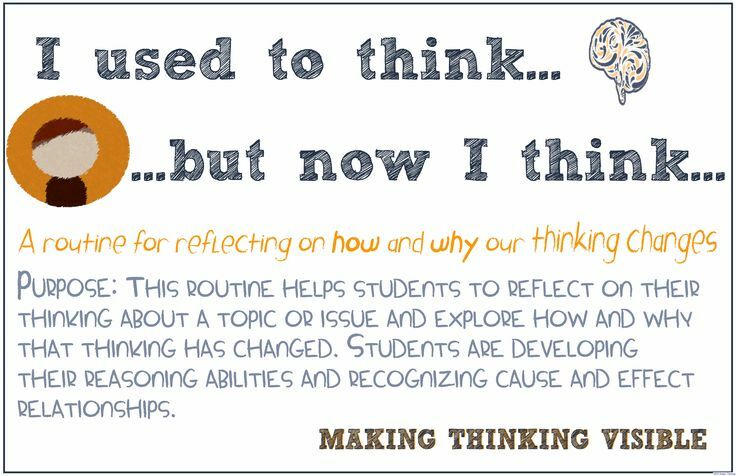 Visible Thinking includes a number of ways of making students’ thinking visible to themselves, to their peers, and to the teacher, so they get more engaged by it and come to manage it better for learning and other purposes. Development of learners’ thinking and learning abilities. Development of learners’ attitudes toward thinking and learning and their alertness to opportunities for thinking and learning (the “dispositional” side of thinking). • Purpose: What kind of thinking does this routine encourage? • Application: When and where can it be used? • Launch: What are some tips for starting and using this routine? The Core Routines are a set of seven or so routines that target different types of thinking from across the modules.